An article in the Scranton Times yesterday, together with the report from the USGS it analyzes, just gave the Josh Fox firewater claim another gut punch. Readers of this blog know all too well how Josh Fox has twisted and turned himself into knots to explain away the fact the Colorado Oil and Gas Commission (as well as the great Phelim McAleer), caught him with his pants on fire over his claim hydraulic fracturing caused a faucet to flame in that state. He has tried to explain away the state’s records indicating the methane had been there all along by deliberately confusing biogenic and thermogenic methane as well as fracking and drilling. He is the original source of the falsehood that hydraulic fracturing processes, which occurs subsequent to and often long after drilling, causes methane migration. Now comes more proof his firewater claim is pure balderdash. 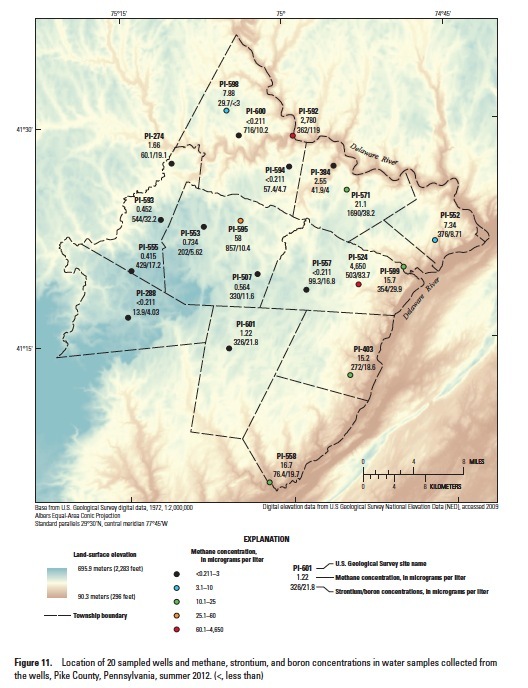 The US Geological Survey (USGS) just published a report on its investigation of water wells in Pike County, Pennsylvania, an area with no gas drilling of any kind other than a few test wells decades ago. Pike County, for those of you from Trenton and points south, is located north of Delaware Water Gap where you don’t go and is underlain with Marcellus Shale. Nonetheless, all but a few acres of it is thought to be “over-cooked” and uneconomical to develop. There are a handful of leases in effect in the far northeast corner of the county but no exploration activity of any kind, despite the hysteria of the county’s serial protestor Alex Lotorto who will be ecstatic he got some more attention with this mention. The USGS report reveal what those of us not indoctrinated in the ideology of fractivism have known all along; methane is found naturally in water wells where there is no drilling taking place. So is arsenic, barium, bromide, lithium, manganese and strontium, to mention a few things. It makes me think back to that silly billboard that was up for about 24 hours in Dimock a few years ago listing elements such as these and implying they were in the water because of hydraulic fracturing, which was false on two levels; hydraulic fracturing has never polluted groundwater anywhere in the US and all the data from multiple USGS and other studies has shown these elements are found naturally in the waters of the Northeast. None of this is to suggest gas drilling can’t induce methane migration. It can, because the methane is already there and a new water well, geothermal well or gas well can, on occasion, create new pathways for it to migrate. Nonetheless, it is increasingly rare due to ever improving drilling and casing methods, as well as the sort of baseline data gathering that took place in this latest USGS study, which helps in locating wells and measuring what’s happening. More importantly, hydraulic fracturing, which occurs thousands of feet below the areas where the migrating methane is located, has nothing to do it. Not so clever fractivists try to dispel this fact by asserting nonsense such as “Well, there’d be no hydraulic fracturing without drilling” or “You wouldn’t be drilling if you weren’t going to do hydraulic fracturing.” That’s like suing the owner of a gas station for causing a car accident because he filled the car with gasoline 50 miles earlier, on the theory the accident couldn’t happen if the car didn’t have gas. It’s pure sophistry. Results of the summer 2012 sampling showed that water from 16 (80 percent) of 20 wells had detectable concentrations of methane, but concentrations were less than 0.1 milligrams per liter (mg/L) in most well-water samples; only 2 well-water samples had concentrations greater than 1 mg/L. The groundwater with elevated methane concentrations also had a chemical composition that differed in some respects (pH, some inorganic trace constituents, and detectable concentrations of tungsten) from groundwater with low methane concentrations. The two well-water samples with the highest methane concentrations (about 3.7 and 5.8 mg/L) also had the highest pH values (8.7 and 8.3, respectively) and concentrations of sodium (up to 69.4 mg/L), lithium (up to 248 micrograms per liter [μg/L]), boron (up to 119 μg/L), fluoride (0.53 mg/L), and bromide (up to 0.353 mg/L), inorganic constituents that can occur in low to moderate concentrations in fresh groundwater but in extremely high concentrations in brines associated with gas-producing Devonian shales in Pennsylvania. The two samples also had among the highest concentrations of other brine-related inorganic constituents, such as barium, strontium and chloride, but samples from several other wells with low methane concentrations also had similar or higher concentrations of these constituents. Relatively elevated concentrations of these other inorganic constituents (as much as 318 μg/L for barium, 1,690 μg/L for strontium, and 50 mg/L for chloride) were present in groundwater with a range of methane concentrations. Sources of many inorganic trace constituents, such as barium and strontium, in the groundwater likely are natural, whereas sources of chloride may be natural or related to human activities, such as road salting or on-site wastewater disposal (septic systems). Groundwater quality generally is good, with few exceedances of drinking-water standards or guidelines in the 2012 samples. One of the well-water samples with elevated methane concentrations also had an elevated arsenic concentration of 30 μg/L that exceeded the maximum contaminant level (MCL) of 10 μg/L for arsenic in drinking water and a pH that exceeded the secondary maximum contaminant level (SMCL) upper limit of 8.5. No other sample from the 20 wells sampled in summer 2012 had concentrations of constituents that exceeded any established primary drinking-water standards (MCLs). However, radon-222 activities ranging up to 4,500 picocuries per liter (pCi/L) exceeded the proposed MCL of 300 pCi/L for drinking water in 85 percent of the 20 well-water samples, and activities were greater than the alternate proposed MCL of 4,000 pCi/L in 10 percent of the samples. Manganese concentrations exceeded the SMCL of 50 μg/L in six samples, total iron concentrations exceeded the SMCL of 300 μg/L in five samples, and pH values were less than the SMCL lower limit of 6.5 in four samples. The two well-water samples with elevated methane had sodium concentrations of 42.8 and 69.4 mg/L, respectively, that exceeded the health advisory guideline level of 20 mg/L for individuals on sodium-restricted diets and the taste threshold SMCL value of 30 mg/L. The isotopic composition of methane in the two high-methane samples ( δ13CCH4 values of -64.55 and -64.41 per mil and δDCH4 values of -216.9 and -201.8 per mil, respectively), indicates a predominantly microbial source for the methane formed by a carbon dioxide reduction process; this type of methane is commonly called drift gas because of its occurrence in glacial sediments. The stable isotopic composition of water (δDH20 and δ18OH20) in samples from all 20 wells plots on the local meteoric line, indicating water in the wells was of relatively recent meteoric origin (modern precipitation), including samples with elevated methane concentrations. The age of the water and the age of the methane in the water may differ. 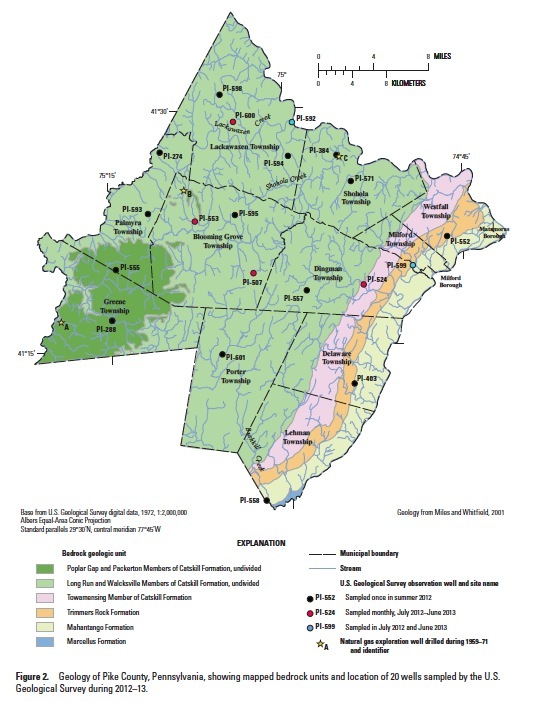 Although the origin of the elevated methane in two well-water samples was identified as microbial, the source of the methane in the aquifer is unknown; however, isotopic composition of the methane suggests possible generation from organic material within glacial deposits that overlie bedrock aquifers in Pike County with some possible small contribution of thermogenic methane from greater depths. Monitor quarterly for one year and install a passive venting system using a vented pipe and vented sanitary well cap. The water sample collected from your water well did not exceed the CDPHE pnmary drinking water standards for the constituents analyzed and the secondary drinking water standards were exceeded for iron, manganese and Total Dissolved Solids. 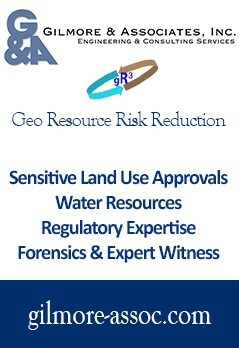 There are no indications of any oil & gas related impacts to your water well. Dissolved methane m the well water appears to be biogenic in origin. The gas exists in sufficiently high concentrations that an explosion hazard could exist if the methane were able to accumulate in a confined space. Care should be taken to ventilate confined spaces where well water is used. This was contained in September 30, 2008 correspondence with Markham, long before any Gasland filming, which, of course, was what Phelim McAleer called him on in this wonderful video of Josh Fox where the latter responded with that deer in the headlights look and his “but it’s not relevant” plea. The methane level in Markham’s well was, to be fair, 14 mg/L, well above the highest Pike County test at 5.8 mg/L (one of the tests in the report indicated as high as 7.3 mg/L – see Table 16) but both situations call for a similar remedy – venting. Yet, Fox would have us believe, wrongly, that not only was the problem extremely uncommon and dangerous, but that it was related to oil and gas development and, specifically, hydraulic fracturing. None of it was true and we see the very same problems are likely to occur in up to 10% of Pike County water wells, although our friend Brian Oram, a local hydrogeologist, says it’s probably closer to 5%. That’s not all that’s similar, either. Pike County wells, far removed from any drilling or fracking contain all sorts of things we’ve seen attributed to drilling and/or hydraulic fracturing, from barium to chloride to sodium to arsenic. The Mike Markham well included many of the same things because they’re naturally found in many water wells. Josh Fox and other fractivists exploited the ignorance on this fact, which is one of the reasons every water well owner ought to buy this publication and read it (proceeds go to a non-profit). Meanwhile, the USGS has done science and the public a great favor by educating all of us on baseless water conditions in Northeast Pennsylvania. They’ve also, without intending to do so I’m sure, given Josh Fox a much deserved rhetorical gut punch for his miserable deceptions. Very timely report – we are working on a private well owner outreach program in Pike County this August 2014. So. If there is no gas to be drilled in Pike County, why does any of this concern us? I have been asking this question for years, but I never get a straight answer. Is there, or is ther not, natural gas in Pike County?!? If there isn’t, why is there so much discussion about it? There may be some Marcellus Shale in Lackawaxen Township that is viable, but there is unlikely to be any elsewhere. There are other formations, however, and the verdict is out on them. There is gas (and oil) underneath Pike County. The question is always whether it’s worth developing.